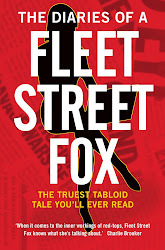 fleet street fox: Poor bloody animals. BEING part of the axis of evil didn't cut the mustard. The forced labour camps never raise much of a global eyebrow. Having one of the worst human rights record of any nation on Earth hasn't caused a stir. 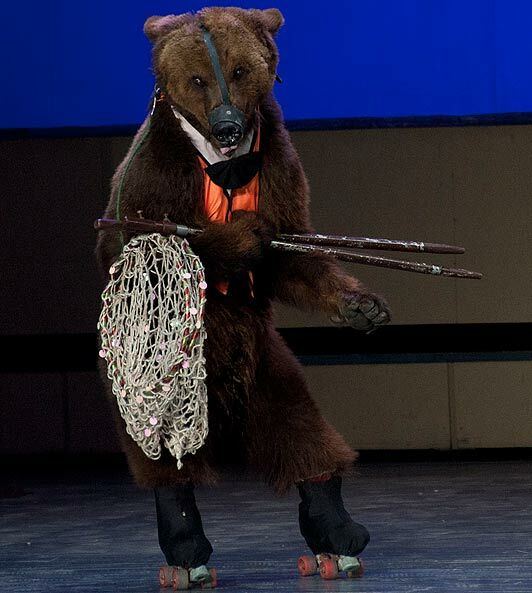 But putting a bear in roller skates for a stage show? WHOA. That's torn it, North Korea! Journalists have been trying to report on life behind the barbed wire in North Korea for years. They usually sneak in as tourists, take a couple of crafty blurred pictures, and leg it back to the land of WiFi and room service as fast as possible. They often concentrate on the illegal street markets, the oppression, the poverty. And in terms of stirring up any international interest each has failed, while no doubt filing some inventive expense claims with the phrase 'no receipt possible' liberally scattered throughout. But every journalist worth their salt knows an animal story upsets or thrills people more than anything about humans. Which is why red-top pictures of a Pyongyang circus have probably done more to ruin North Korea's reputation with the general public than anything else. 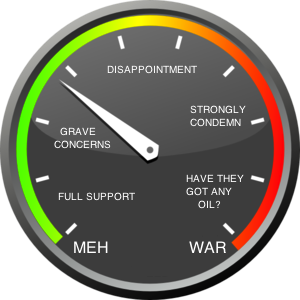 You can annoy Human Rights Watch and upset Amnesty International; you can irk Hillary Clinton and William Hague, irritate the United Nations, fire test missiles at your neighbours or execute dozens of children, if you fancy. Not much will happen; at best you'll get a strongly-worded statement of disappointment from a committee of something or other. But if you come to the attention of the animal rights crew you're in the mire and no mistake. They never give up. They don't accept two-faced reassurances. They don't ask permission to send inspectors. These people mean business. After seeing the Pyongyang pictures the People for the Ethical Treatment of Animals thundered: "This sounds like it's straight out of the Dark Ages... animal acts have no place in any civilised society." Excuse me, PETA, but where the hell have you been? What about the labour camps for dissenters which are 30 miles square and have 200,000 people living and dying in them? Where they are raped, suffer forced abortions, and are subject to medical experimentation of the kind practised by the Nazis? What about the fact that until recently you could be executed for listening to South Korean radio? Or that North Korea is 177th out of 178 countries for press freedom? How about noticing the millions who died in a three-year famine in the late 1990s and more still when the US slashed food aid by 90 per cent in 2004? 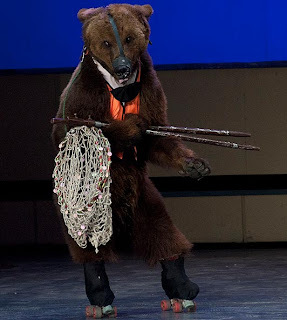 To be fair, there were no dancing bears involved in any of that so it wasn't up to PETA to moan. It was up to everyone else though, and not many did. Those who bothered were largely ignored by the rest of us, because if there aren't baboons on rollerskates we're not going to notice. It's a horrid fact of humanity that we don't care about humans as much as we care about everything else. Animals. Pets. Trees. Little bugs on the bottom of the Severn estuary which might get squidged if they build a wave turbine. All those things provoke a campaign, get the grannies worked up and often produce results. A friend of mine once filed from Iraq on a stray dog rescued by soldiers after it was thrown over their compound wall. "We got £15,000 in a week from readers to pay for his shots and bring him back to Britain," he told me in despair. "Then I wrote about Iraqi kids having their legs blown off and we got bugger all." And that's why animal stories make the papers more often. Human suffering gets a shrug, not just from us but from the diplomats and politicians which represent us. It is seen as acceptable, not least because admitting it's unacceptable would involve having to sort it out. Even when that suffering is far worse than the animals'. If you asked the average North Korean whether he'd prefer prancing about in a tutu and roller skates to being interned in a labour camp on the basis of his religion or education, he'd probably vote for the circus. There are two chances for the people of North Korea. The first is that it is rich in coal, zinc, iron, salt, lead, tungsten, gold which the rest of the world will want to get its hands on at some point. The other is that if they are treated like animals for long enough, people everywhere else might think they're worth saving. There is no organisation called People for the Ethical Treatment of People. There probably should be.